A fracture is the term used to describe a broken bone, and a nondisplaced fracture is just one of three types of bone fractures that can occur. When a break is non-displaced, that means the bone is broken but still remains in place. In other cases, a break will cause the bone to lose its natural shape. This is referred to as a displaced fracture. In extreme instances of bone fractures, the bone will become dislodged to the degree that it can be seen protruding through the skin. All types of bone fractures are painful, and they all require treatment and time to heal. Falling is one of the most common cause of bone fractures. A bone will break when an extreme force or pressure is applied to the bone, causing it to bend in a way that it was not designed to move. Bones are not unlike sticks in that they will snap if they are bent too far past their limits. A person generally knows when they have broken a bone because it is extremely painful. Symptoms of a non-displaced fracture may not be as severe, because the bone has not been moved out of position. Basically, it just has a crack in it. Non-displaced fractures are still intensely painful, however, and their most prominent symptom will be severe swelling just like any other broken bone. In the most critical bone fractures – open or compound fractures – the bone will sticking out through the skin, and there will be no doubt that the bone is broken. With displaced and non-displaced fractures, diagnosis usually requires a medical examination and an x-ray. The x-ray is used to determine the extent of the break as well as to see if there is any damage to the surrounding joints and tissues. Since there are few outward signs of a non-displaced fracture, the x-ray is likely the only way to determine that there actually is a break in the bone. 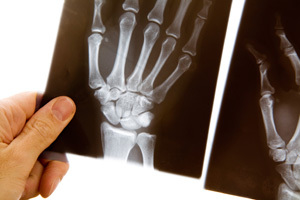 On rare occasions, a fracture will not be visible with a regular x-ray. This may be due to the location of the break or the way in which the bone has been broken. When a doctor cannot properly diagnosis the break with an x-ray, they may perform a CT scan, which uses radiation to highlight abnormalities in the bones. In the time immediately following a bone fracture, it is important to apply ice to treat the swelling and keep the broken bone as still as possible. If the bone has been significantly displaced, it will need to be reset before healing can begin. Resetting must be done by a medical professional and should be accomplished as soon after the break as possible, in order to prevent the bone from resetting improperly. A non-displaced fracture does not have to be reset, because the bone is just cracked and has not moved out of position. Open or compound fractures may require surgery in order to reposition the bone. Once the bone is reset and back in its normal form, a cast or splint will be applied. This is to prevent the bone from being moved out of position during the time it will take to heal. Broken bones heal rather quickly, taking anywhere from 4 to 12 weeks, depending on the severity of the break. Since bone fractures can be quite painful, a prescription or over-the-counter pain killers may be recommended throughout the healing process.